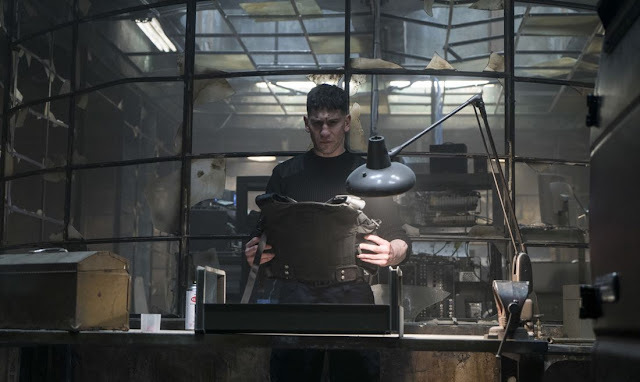 Jerome Wetzel TV: Glutton For THE PUNISHER? Article first published as TV Review: THE PUNISHER on Seat42F. If you’d like to watch a Marvel television show, but are concerned that the mythology has become too dense with all the Netflix series, ABC programs, and films already out, THE PUNISHER is for you. Released on Netflix, and featuring characters and settings introduced in other series on the streaming service, it also stands completely on its own. It can be enjoyed without prior knowledge, which is a bit refreshing, a self-contained story that is intense and enticing. As THE PUNISHER begins, Frank Castle (Jon Bernthal, The Walking Dead) has completed his revenge mission. He has killed everyone involved with the death of his wife and children, his sole mission in life these past years. Six months later, he still hasn’t reengaged with the world, and avenging their tragedies hasn’t brought him peace. What will he do now? Well, The Punisher as a character has a very clear focus: take down people who have done wrong, often in brutal, merciless ways. Even if his own personal journey is complete (something that may or may not actually be true), his talents can be put to use for other causes. And while Frank isn’t a team player that’s going to go sign up with a group of, say, Defenders, nor will he be embraced by law enforcement because of his methods. So solo vigilantism seems to be his best choice, and he certainly has opportunity to do so. Like other Marvel shows on Netflix, THE PUNISHER begins slowly enough. We get Frank’s story first and foremost, but because there are thirteen hours to fill, we are introduced to a few other characters. David Liberman, a.k.a. Micro (Ebon Moss-Bachrach, Girls), has a similar story to Castle’s, though his wife (Jamie Ray Newman, Bates Motel) and children are still alive. Still, he’d like Frank’s help. At the same time, Homeland Security Agent Dinah Madani (Amber Rose Revah, Indian Summers) has been called back from overseas as she sticks her nose in where it isn’t wanted. Her mission, assisted by black sheep agent Sam Stein (Michael Nathanson, The Knick), is sure to bring her into Frank’s orbit soon. The Punisher is a tough character to do on screen because he likes to wall himself off so much. Sure, Karen Page (Deborah Ann Woll, True Blood) and Curtis Hoyle (Jason R. Moore, The Sorcerer’s Apprentice) may have made inroads that he tolerates, but Frank doesn’t surround himself with friends or family. And that’s a problem on a long-running story, forcing a very narrow focus. Only two episodes in myself, I don’t know if THE PUNISHER can sustain its momentum. But from what I’ve seen, I think it certainly has added enough to stay engaging as a show without ruining the core of who Frank Castle is. I can’t say this is my favorite Marvel Netflix series so far; Jessica Jones and Luke Cage both had some strong takes on the world with important messages. But what I like about THE PUNISHER is that it truly is a character study on a unique individual, one far more violent than most of us would ever consider being, but who also is someone to root for, at least partially. With Bernthal doing a terrific job as the taciturn non-hero, I do greatly enjoy seeing the personality built in a complex, fully-formed way. I like THE PUNISHER. I’m too early in the run to make any sweeping judgments on the series as a whole, but the first two hours show a lot of promise, and I definitely will commit to watching more. It’s already better than some of the other Netflix Marvel shows. And while I’m the type who like a bunch of shows tied together, I also dig that THE PUNISHER provides an alternate option, without abandoning the shared world altogether. THE PUNISHER season one is available on Netflix now.